Venice is a dream come true for the romantic traveler. This beautiful city is interesting in a large lagoon located near the Adriatic. Venice is built on wooden poles that are stuck deep in mud shoals and islets. This interesting architecture is like flying over water. You can not go to Venice and forget to hire a water taxi allowing you to stroll along the famous Grand Canal, which reveals exciting and beautiful city views. Venice is located in Northern Italy and is the capital of the Veneto region. The whole city is situated on a shallow lagoon on the Adriatic Sea. Venice props on stands over 118 small islands. The area of the city lies between the estuaries in Po and the Piave. The central area of Veneto is also the major port on the Adriatic coast. In the town of Venice, there are about 300 000 people. 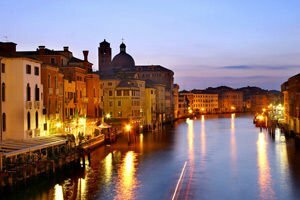 Known by nicknames such as - Queen of the Adriatic, Water City, City of Bridges and city of canals, Venice is one of the most popular tourist destinations worldwide. 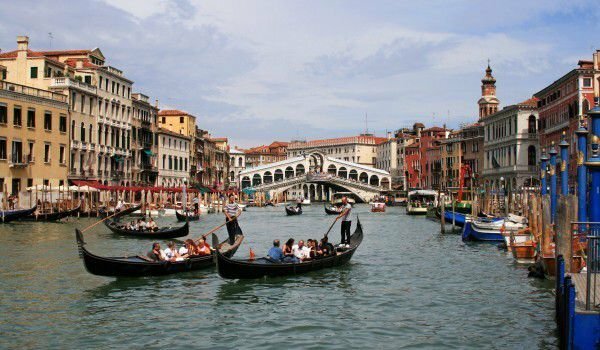 Venice is a glorified and attractive seaside resort with world significance. The huge popularity of the city is a prerequisite to host international film festivals, art exhibitions and many other cultural events. The urban transport is preserved to the traditional city gondolas and motorboats, which are part of the business cards of Venice. All of Venice is unique because of the way of the construction of the city and the architecture of its buildings and their location. Due to its uniqueness Venice is included in the UNESCO list of world historical and cultural heritage. Much of the typical Venetian architectural masterpieces were built by the great Renaissance architect Andrea Palladio (November 30th, 1508 - August 19th, 1580). A pleasant time to visit Venice is during the two weeks before Lent, when there occur endless carnival and pleasant evenings. The Grand Canal is the largest canal, which winds through the center of Venice for 4 km. Along its entire length on both sides of the water are 300 incredible arranged palaces, which have witnessed the ancient Venetian blend of Byzantine and European architecture. Most of these priceless buildings are a reflection of the glorious times of Venice, and feature elegant design with rich ornamentation and detail. Perhaps the most emblematic in this regard is the Doge's Palace, which is located on Piazza San Marco - St Mark's Square. The massive building and the old castle dominates Venice. It is the ruler's residence and the seat of governance for 700 years. There are 177 channels in order to cross the territory of Venice. Above them are a record amount of 450 built bridges that connect the total six Venetian neighborhoods. You can also tour one of the best galieries and museums of Venice. Among them are the Academy - Gallerie dell'Accademia and gallery Franketi Giorgio which is located in the Gothic castle Ca'd'Oro. 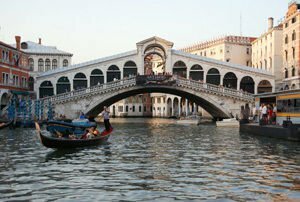 We can also not forget to go and see the Bridge of Sighs, which connects the Doge's Palace with the prison in Venice.